10 CINEMONTAGE / SUMMER 2015 MEMBERSHIP OUTREACH by Stephanie Brown and John Vitale O ver the last few years, at all of the various Membership Outreach Committee's events (roundtables with scripted and unscripted television editors/assistants/music editors and Partnerships in the Editing Room sessions, including editorial teams and associate producers), the Guild membership has expressed alarm at the lack of mentorship opportunities and on-the-job training in post-production today. Traditionally, mentoring naturally occurred within the workplace, with the seasoned professionals taking time out to bestow upon their crew the philosophy, skills, techniques and guidance of the craft. Over time, with the advancement of technology, condensed schedules and more demands placed upon each working member, these opportunities have become fewer and fewer — to the point where mentoring now seems to be available only to a lucky few. Mentorship is built upon trust among all Editors Guild classifications. Building a good working relationship with another member allows for the sharing of years of experience, ensuring that our next generation of members continues to learn the talents of their predecessors. Mentors feel a sense of pride watching their "mentees" succeed when presented with the chance to upgrade to a higher classification. This also allows for consistency in the way our craft is being performed. Let's get the conversation going again and hopefully put mentoring back into the workplace. Members should be encouraged to ask themselves, "Who was my mentor? Who have I mentored?" Answering the questions of assistants or other crew working under you is the beginning of the learning process. Our days are busy, but we need to think of creative ways to fit in opportunities to mentor. Find the time — whether it's a 15-minute lesson or a two-hour tutorial. If we make mentoring a part of all of our days, it will improve morale, help break up the extremely long days we all work and bring all Guild members closer together. Most importantly, this can foster community. Being in a union is about supporting one another. As an example, the Membership Outreach Committee's recent panel last May — featuring editors, assistant editors and associate producers working in the half-hour television format — was an informative discussion about relationships between the editing suite and management. The focus was on how to work as a cohesive unit to accomplish common goals. Two main points that came out of the panel: communication and camaraderie. All parties involved must be willing to communicate with each other about issues and finding solutions to address them. And all the panelists agreed that the key to successful working relationships is camaraderie. The three editors on the panel said that they loved interacting with their assistants and asking them for their thoughts and opinions about cuts. Feedback not only was needed, but encouraged. Which brings us back to the point of mentorship. All on the panel valued mentorship and said they made sure it happened within their cutting room. However, it was said, the interest had to be mutual. Editors need to know that their assistants are interested in being mentored. But also, the editors need to take the time to make sure it happens. To read CineMontage's coverage of the panel, see the website-exclusive article "Managing Post for TV Sitcoms" at www.editorsguild. com/FromTheGuild.cfm?FromTheGuildid=513. 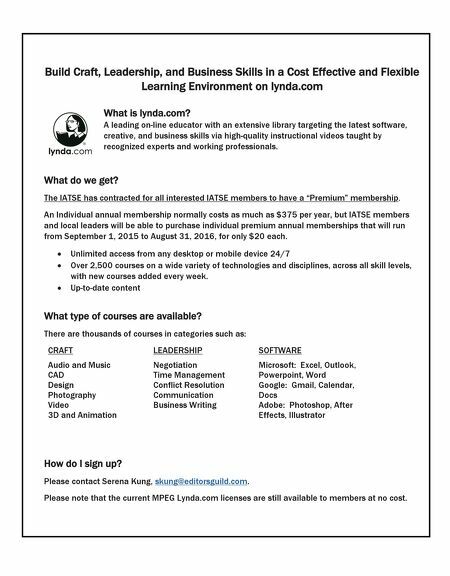 The Membership Outreach Committee wants to create a real opportunity for mentoring and is considering starting a pilot program, a Master Class of sorts. Experienced members proficient in their craft would teach a class and those who enroll would actually do the work, and then receive constructive criticism from the teacher. This may not be as ideal as on-the-job mentoring, but it's a start; the goal is to create an atmosphere where there is one-on-one feedback. The program will not be limited to picture editors and assistants, but would encompass all the job skills that our members perform. What are your thoughts and opinions about a mentoring program? Would you be interested in teaching a Master Class? Contact the Membership Outreach Committee at outreach@editorsguild.com or join us at the I AM THE UNION Facebook page (www.facebook.com/groups/iamtheunion/) to tell us, to offer suggestions for future panels and events or to ask questions. We welcome your input. 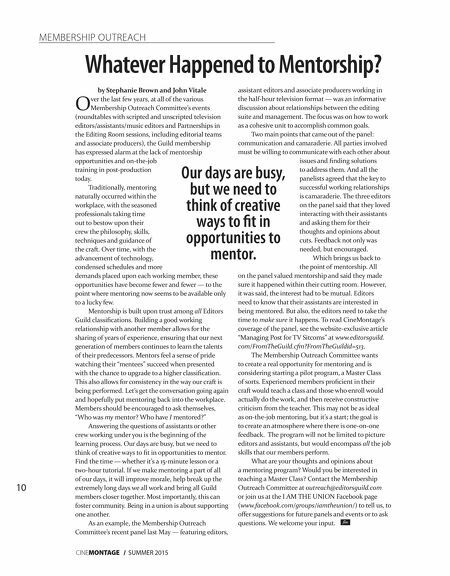 f Whatever Happened to Mentorship? Our days are busy, but we need to think of creative ways to fit in opportunities to mentor.